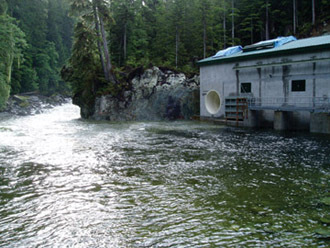 Canadian Hydro Developers Inc. is proving that smaller run-of-river hydro developments, like its recently completed Upper Mamquam project, have a place in the alternative energy spectrum. A downturn in the energy business in the mid-1980s spurred two Canadian entrepreneurs involved in oil and gas exploration to hitch their wagon to renewable energy and the development of smaller hydroelectric power projects and other alternative energy projects instead. It seems that taking that risk was definitely well-timed and worth it. John and Ross Keating-the former a chartered accountant and the latter an electrical engineer-founded Canadian Hydro Developers, Inc. after energy prices went south, along with oilpatch activity. John says it seemed like a more viable business than the energy industry. Their very first project featured run-of-river technology tied into the extensive irrigation water works constructed in southern Alberta, Canada. "We were unique, and people didn't really understand what we were doing on our first project," says John Keating. "But it was our intent, certainly, to develop a long-term sustainable business model and I think we have accomplished that." The company's first run-of-river irrigation project cost $3 million, and it took a lot of time to navigate through the red tape within a regulated electrical power generation environment. The company later sold a 50 percent interest in the project for $2.5 million. "I thought, well, that's pretty good," says Keating. "We almost got our money back and still had half an interest in the plant." The company's business plan to pursue smaller power projects based on renewable energy sources progressed slowly through the 1990s. But things really took off when power brownouts and blackouts started occurring regularly in the summer of 2000 in heavily populated areas like California, due to a shortage of electricity. "It showed what can happen to power prices if supply is not maintained properly," says Keating. Canadian Hydro Developers' 25-megawatt Upper Mamquam project near Squamish, British Columbia has been certified as a Green Power facility. The company has a 20-year agreement to supply power generated at the plant to BC Hydro. Today, Canadian Hydro Developers is said to be unique with its varied portfolio in renewable energy projects. A publicly traded company with a market capitalization of about $850 million, the company now fully owns or has a partnership in 12 water-based power plants, six wind power plants, and one biomass power plant. The facilities are located in the Canadian provinces of Ontario, Alberta and British Columbia. The company also has five water-based and two large wind power projects on the drawing board. Unlike other small hydro developers, Canadian Hydro Developers never had the intention of leveraging its projects to the hilt, producing three or four projects, and then profiting from being bought out by someone larger. It prefers to have 100 percent ownership-16 of its 19 projects are wholly-owned. It also typically operates on a 65 percent debt to 35 percent equity ratio on a construction project. "What this means is that when we build a plant, even if we have the worst hydrology years or the worst wind years in terms of historical records, the project will stay afloat," says Keating. "I think we have an exceptionally strong business model. Smaller independent power producers or aspiring independent power producers will quite often refer to us as the ideal case." Being headquartered in Calgary, Alberta, home to one of North America's largest concentrations of oil and gas company head offices, has benefited the company. "We are in the energy business," says Keating. "I don't see electricity generation from renewable sources as being any different from gas production, because natural gas is only good if you burn it to create either heat or electricity. With our fuel sources being wind, water and wood waste, these are natural sources, but the end product is the same. It's energy." He points out, however, that there is a distinct cost advantage to using renewable energy sources to generate power versus fossil fuels. "Renewables do not have a fuel consumption cost," he says. "The fact that we have no fuel input costs means that our gross margins are very large. "We can sign a contract with the longevity of a hydro plant, for as long as 50 years. You will not find a coal-fired plant capable of doing that." 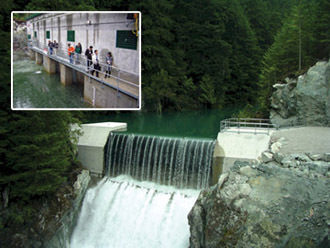 Canadian Hydro Developers' most recent project was the commissioning of the 25-megawatt (MW) Upper Mamquam Hydroelectric Plant near Squamish, British Columbia at a cost of $33 million U.S. The company has a 20-year agreement to supply power generated at the plant to provincially-owned BC Hydro. The project features run-of-river technology, which Keating describes as, "beautiful technology that has been around forever." Essentially, it starts with the selection of a watercourse that has a steep vertical drop over a short distance. A portion of the water is diverted through a pipeline and the force of gravity pushes the water past a set of blades that turn a shaft on a power generator. "It's very simple technology," says Keating. Development of smaller hydroelectric projects based on this technology is essentially a throwback to how power was typically generated at the turn of the last century. "Projects in those days were built to provide power to a local community or industry like a sawmill," says Keating. "Now we have electric grid everywhere. So when we put a project on line, it just goes into the grid as opposed to serving a local community." Over time, smaller projects like these became less popular as large megaprojects built and operated by government-owned utilities gained favor with politicians because of their political appeal. Projects like the Hoover Dam in Nevada and James Bay in Quebec are examples of those types of projects. However, two shifts in government policy have worked to Canadian Hydro Developers' advantage. The first is a program launched by the Alberta government in 1988 called the Small Power Research and Development Act. It required the locally regulated power utility to buy independently produced power at legislated rates that were designed to approximate their replacement cost if the utility were to have built a facility themselves. It functioned like an incubator for renewable power projects. The market for renewable power really spiked when deregulation of wholesale electric power production occurred in January, 1996. Today, Alberta is the only Canadian province that does not own a utility, in an environment of deregulated retail and wholesale power marketing. Water flows over the intake weir at the Upper Mamquam project and guests tour the powerhouse at Upper Mamquam (inset photo). The second shift in government policy since the turn of the millennium has come about as a result of the public's greater concern for the environment. Recognizing the winds of change, the environment has now become a political priority. According to Keating, both large utilities and governments now want more renewable power capacity put in place, in response to consumer demand, As a case in point, the Upper Mamquam project is certified as a Green Power facility under the Environmental Choice Ecologo program, which requires that projects use a renewable resource, and be environmentally and socially responsible. "A lot of studies go into in-stream flows and acquiring a water license that allows for a portion of the stream flow to be diverted while maintaining in-stream flow to maintain the aquatic life," he says. "Not all watercourses have fish." In situations where there are fish, smaller hole sizing on the trash rack prevents larger fish from entering the intake. Besides stream flow and the drop in elevation from the intake pipe to the power house, other factors taken into consideration when evaluating a possible run-of-river project include the project's proximity to tie into the power grid and whether there is room on the distribution line. 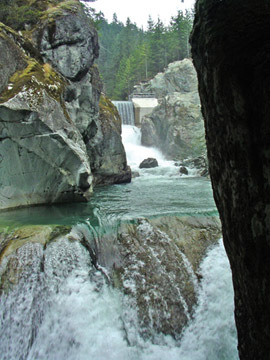 The Mamquam project required Canadian Hydro Developers to gain permission from the Squamish First Nation to run a transmission line across their property to tie into the provincial grid. Keating says those negotiations were very successful. There is much more potential for run-of-river project development in Canada than in the United States, says Keating, where somewhere in the neighborhood of 700 projects already exist. He says that's because of the larger population in the U.S. and the need for greater power demand at an earlier stage of development. That doesn't necessarily mean that the potential for more projects doesn't exist, but it is more difficult to find the right infrastructure to produce a viable run-of-river project in the U.S. However Canada, particularly northern Canada, is another story entirely. The power grid is still developing as one travels further north and there are many potential watercourses that would lend themselves to installation of this type of technology. Canadian Hydro Developers has shown, of course, that is also possible to use run-of-river technology on irrigation systems. In fact, there are certain economic advantages to investing in this environment versus a typical mountainous locale where a river undergoes a steep drop. "If you are on the prairie and it's an irrigation structure, chances are it's pretty simple, because you are not having to build too many roads or take too many trees down," says Keating.